Here you can get an overview of our latest concepts, functions and designs. On the pages below you will find selling points, online applications, brochures, product information and information relating to safe installation. Beautifully refreshed vegetables: hansgrohe serves up some new masters of the kitchen, featuring various jet types and technical finesse. 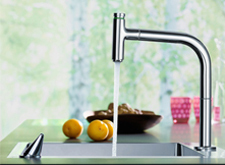 The company also introduces its unique push button technology to the kitchen with these – making the control of water more convenient and mixer operation more intuitive. This makes working at the sink unit a lot simpler. Bring the beauty of water into your bathroom with the unique showering feeling of PowderRain - an instant the velvety-soft sensation. New stability in the bathroom: the Unica Comfort shower range provides extra support, safety and comfort in showers and bath tubs. 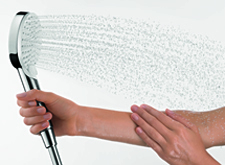 In bathrooms and kitchens, clicking is very much in vogue: on XXL overhead showers such as Rainmaker Select, Showerpipes or tablets, your customers can create their own enjoyable showering experience at the touch of a button – and discover a whole new dimension of showering fun. On bathroom mixers such as Talis Select, form and function now also merge together at the simple touch of a button. 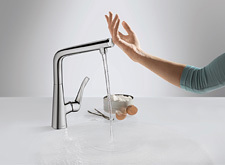 Now even sink chores are fun to tackle: with Metris and Talis Select kitchen mixers. Croma makes the switch: to an even higher level of convenience, through the use of smart Select technology. The new designs in the Croma Select range also make it impressive. The super-economical shower for both hotel and private bathrooms: The new Crometta range is affordable and low-consumption. The new Crometta 100 is a design great to fit the smaller budget. The overhead shower and showerpipe are also impressive in terms of their function, design and value for money. The kitchen is the focal point of everyday life: a place where we cook, eat, laugh and live. The new sinks and mixers provide aesthetic indulgence and make chores even easier. The bathroom is a place for us to retreat and relax – with its new shower and mixer ranges, hansgrohe will transform your daily encounter with water into an unforgettable experience.